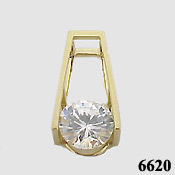 Stock #6620: Solid 14k Yellow Gold 2.75 ct Russian CZ Cubic Zirconia Slide/Pendant Solid 14K Gold ... Large bail accomodates any size chain, including Omegas...Unbelievable Price!!! Very Nice Stones!!! Top Quality, Russian CZs are more precisely cut & polished from the finest CZs available (Look better than most diamonds!). This item is Sold OUT and will take 4-5 weeks!